Boca Raton police say they have been kept busy tracking down and arresting a half-dozen teens suspected of burglarizing vehicles in the city. 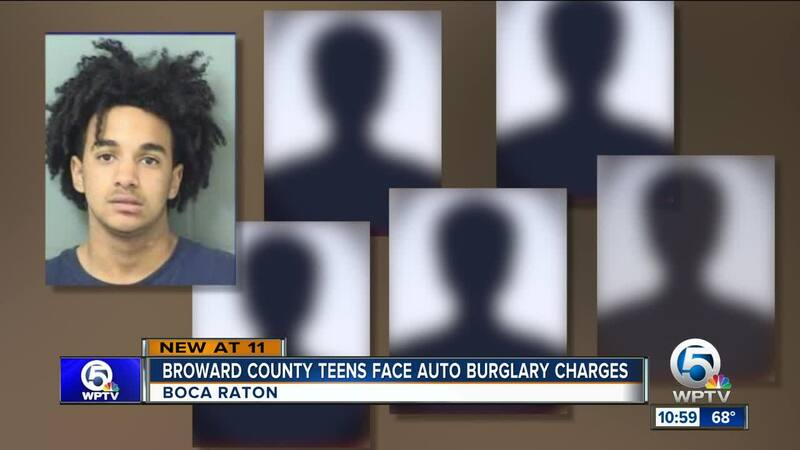 BOCA RATON, Fla. — Boca Raton police say they have been kept busy tracking down and arresting a half-dozen teens suspected of burglarizing automobiles in the city. Police say they stopped 18-year-old Tyre McNeal and a 15-year-old who were trying door handles in Vistazo. They say McNeal was in an unreported stolen vehicle from Vista Hills. A 17-year-old and 15-year-old face charges of auto burglary, burglary to a dwelling and petit theft for suspected crimes in Boca Madera. Police say they also face charges of grand theft auto, and auto burglary because they stole a vehicle from Boca Harbour. Another 15-year-old entered three vehicles in a driveway in Blue Inlet and also faces burglary charges, police said. And detectives have charged a fourth 15-year-old with multiple counts of auto burglary for alleged crimes in Palm Beach Farms, Camino Lakes and Camino Gardens. All the teens are from Broward County. Investigators said the vehicles were easy targets because they were either unlocked or key fobs or keys were left inside. In one auto burglary a handgun was taken. Police urge the public to remove valuables and key fobs from vehicles before locking them. You have read about the arrests @bocapolice made recently where all the cars stolen either had keys or fobs left inside.